No one's ever accused baby gear of being particularly stylish, but Boon is here to change that. Dedicated to creating hard working essentials with an eye for seriously cool design, founder Rebecca Finell has successfully bridged the gap between function and style. 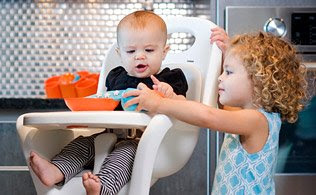 From futuristic high chairs to looping bookcases, you won't mind displaying these fun, brightly colored pieces around the house.